Oracle Corp. has hired former Hewlett-Packard Co. CEO Mark Hurd to help lead the database software maker in a pivotal moment in Oracle's 33-year history as it tries to muscle in on more of HP's turf. Hurd's appointment Monday as co-president of Oracle comes a month after he resigned from HP following a sexual harassment investigation. Oracle CEO Larry Ellison loudly came to Hurd's defense at the time, calling HP's decision to oust Hurd the worst personnel decision since Apple Inc. forced out Steve Jobs another of Ellison's friends 25 years ago. Oracle and HP are longtime partners, working together for 25 years to make sure their products are in sync. But Hurd's new job underscores the growing fissure between the Silicon Valley heavyweights. Oracle is now competing in one of HP's biggest businesses selling the computer servers that power businesses' back offices. The company said in a statement that Hurd will also serve as a member of the board of directors and will report to Ellison. Shares of Oracle, which is based in Redwood Shores, increased $1.22, or 5.3 percent, to $24.14 in midday trading Tuesday. Ellison praised Hurd's tenure at HP and said no other executive had more relevant experience. "Mark did a brilliant job at HP and I expect he'll do even better at Oracle," Ellison said. "There is no executive in the IT world with more relevant experience than Mark. Oracle's future is engineering complete and integrated hardware and software systems for the enterprise." One of Oracle's two presidents Charles Phillips, a former Marine and investment banker who was with the company for seven years is resigning to make room for Hurd. The other Safra Catz, Oracle's former chief financial officer is staying. Ellison said that Phillips wanted to leave in December, but that Ellison asked him to stay through the integration of Sun Microsystems. Phillips was in the news earlier this year when pictures of him snuggling with his former mistress appeared on billboards around the U.S. Ellison said Oracle will miss Phillips' talent and leadership but that he respects Phillips' decision to leave. The latest moves amount to little more than management maneuvering involving business celebrities, with Hurd and Ellison being two of the biggest names in technology, and Hurd's ouster from HP being one of the great dramas in Silicon Valley history. In hiring Hurd, Oracle doesn't necessarily get everything he knows. Part of Hurd's severance package from HP which could top $40 million includes a confidentiality agreement that restricts what he can tell a future employer about internal HP dealings. Still, what Oracle is getting is Hurd's ability to steer a sprawling technology company and find ways to make it even bigger. HP cleared $114 billion in revenue in its last fiscal year, while Oracle had nearly $27 billion. 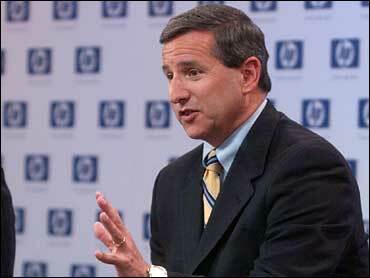 Hurd is being tapped as Oracle undergoes a similar transformation to the one he spearheaded in his five years atop HP. Oracle is in a richly profitable business as the No. 1 seller of database software, but is trying to carve out territory in other areas. Oracle has been on a $40 billion buying binge since 2004, scooping up companies in other parts of the business software market, and with the $7.4 billion deal for Sun last year, Oracle became a direct competitor to HP in computing hardware specifically, servers. Hurd presided over a similarly massive makeover at HP, where he engineered more than $20 billion in acquisitions. Those deals helped HP become less tethered to printer ink as the source of the bulk of its profits. HP is now a player in technology services where it's battling IBM Corp. and computer networking where it's taking on Cisco Systems Inc., which is also now making its own servers and challenging HP in that market. Hurd is known as an extreme cost-cutter. HP announced about 50,000 job cuts during his tenure. Ellison has said the HP board's decision to publicly disclose the harassment claim against Hurd amounted to "cowardly corporate political correctness," as the board had found that Hurd didn't violate the company's sexual harassment policies. HP has emphasized that its board voted unanimously for Hurd's resignation. HP's investigation unearthed inaccurate expense reports connected with Hurd's outings with his eventual accuser, an actress and HP contractor named Jodie Fisher. She claimed that her work helping organize HP events dried up after she rebuffed Hurd's advances. Hurd, 53, who is married with two children, denies making any advances on Fisher. Hurd also insists he didn't prepare his own expenses and didn't try to conceal his outings with Fisher, which often included dinner after the events Fisher helped organize and that Hurd attended.